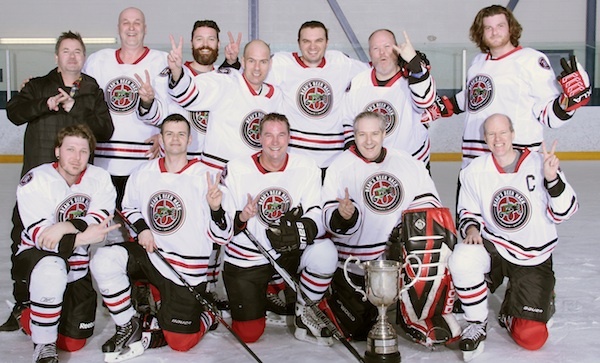 TORONTO - The Beau's Beer Hack made league history this past Saturday night as the first-ever UUHA team to win back-to-back Championships. They did so in dramatic style, too, as Hack veteran Chris Barkley lit the lamp midway through a 5-minute period of sudden-death overtime, curtailing a similarly historic run for the Parkdale Hockey Lads, who came within a whisper of victory in their first-ever trip to the Final. Mere minutes prior to the final goal, the Lads appeared to be down for the count as a pair of successive minor penalties saw the squad at a two-man disadvantage and trailing by a goal with less than 2 minutes on the clock. But sniper Kyle Welton had other ideas, intercepting a Hack pass and skating in on a breakaway to solve goaltender Aaron Brophy with a high, hard shot off the inside of the right goalpost and into the back of the net, prompting the dozens of spectators to erupt in raucous adulation. The shorthanded tally held up through the remaining penalty kill, sending the game to overtime with the score tied at 4-4. Despite momentum seeming squarely on the Lads' side, though, it would be the Hack who scored next, punctuating a comeback that saw them trailing 2-0 in the opening frame with a golden goal and a repeat claim on the UUHA title. The Lads opened the scoring in the Championship game with Dave Ball converting a net-front feed from Kyle Welton at the 8:38 mark of the opening frame. Fil Freitas put the Lads up by a pair eight minutes later, solving Brophy with an unassisted wrister. But with just 1 second remaining, Stefan Barkley slid one past Lads goaltender Luis Freitas to halve the Hack deficit and prompt some buzzer-beating energy to his bench going into the 2nd period. The Hack would score the next two goals, as Chris Barkley combined with Blake McDonald for the tying tally 7 minutes in, before Lance Moreton put the reigning Champions up by a goal 3 minutes later (assisted by Doug Graham). But with under a minute to play in the period, Lads forward Mike Ryan would find linemate Ian Seeton streaking to the net where he would perform some knotology of his own, beating Brophey to reset proceedings at 3-3. Apparently determined to do it alone, Hack veteran Stefan Barkley again tilted the ice in his team's favour just a minute-and-a-half into the 3rd with his second unassisted goal of the game. The Lads would play catch-up for the next ten minutes as Luis Freitas denied repeated Hack attempts at insurance markers, while his cross-ice counterpart maintained a strict closed-door policy of his own... until Welton's highlight-reel double-shorty upped the game's drama ante considerably, providing what may be remembered as the game's definitive moment, despite the eventual outcome. In other UUHA Finals Night outcomes, the Humiliation claimed the 2016 Bronze Medal by defeating the Jokers 3-1. Mike Thompson opened the scoring and also potted what would stand up as the game-wining tally in that contest (Aaron Knight, Paul Morris and Stephen Cribbin were credited with assists on the goals). Andrew Blakeley added an unassisted empty-net goal, while the lone Jokers' tally was scored late in the 3rd period by Gary Rideout Jr. with Steve Levine and Charlie Rishor assisting. Jokers veteran Frank McAnulty, who passed away earlier in the week, was also credited with an assist on the goal. McAnulty (whose sweater was displayed throughout the game, and whose name and number adorned each of his teammates' jerseys) was also honoured with a Star of the Game designation. And in the Consolation Final the Parkdale Porcupines blanked the Brockton Rockets 3-0. Adam Thrasher scored the 1st and 2nd goals for the Porcs, while Mike Clarke added some additional insurance with a 3rd-period power-play tally. Andrew Stirk earned the shutout, while Todd Moffat, Jay Browne, Clarke, Lorne Kredl and Marc Hickox claimed assists on the various goals. Live rink rock was provided throughout the evening by members of the Wheatfield Souldiers, along with personnel from the Porcupines, Jokers and Humiliation sitting in.